WHAT IF NAPOLEON HAD WON THE BATTLE OF WATERLOO? He’d certainly have been a very happy man and Europe would have been a very different place. There would never have been a Waterloo Station in London, though there might have been one in Paris. No one would ever have heard of Wellington boots and whole generations of kids at school in the UK might have been wearing Napoleon Boots as they walked to school on rainy days. The wonderful abbreviated lexical form « Wellies » (for Wellingtons) would never have made it into the English language. If Napoleon had won at Waterloo, all of Europe might have been French. We’d all be speaking and eating French – Baguettes and snails instead of roast beef and Yorkshire pudding. We might also have gone metric a lot earlier, meaning that I wouldn’t have had to learn metres and kilometres and kilogram’s, but still have to reckon in miles, pounds and ounces. Even nowadays, no one in the UK goes to the market and buys a kilo of apples. Even youngsters still buy fruit, veg and meat in pounds and no matter where you go in the UK it is still miles. We might have got the Channel Tunnel a century or two earlier. Mad as it may seem, Napoleon apparently had plans afoot to build a tunnel so that he could invade Britain. If Napoleon had won at Waterloo, Swedish super group ABBA would never have won the 1974 Eurovision Song Contest with their catchy eponymous ditty. They might have won with a song of a different name or quite simply, they may not have won at all, and for the past 40 years we would have been living in an ABBA-less world. If Napoleon had won at Waterloo, countless generations of British kids would not have been bored stiff in history lessons listening to how a bloke who invented a boot won a battle in a place with a name that sounds like a toilet. 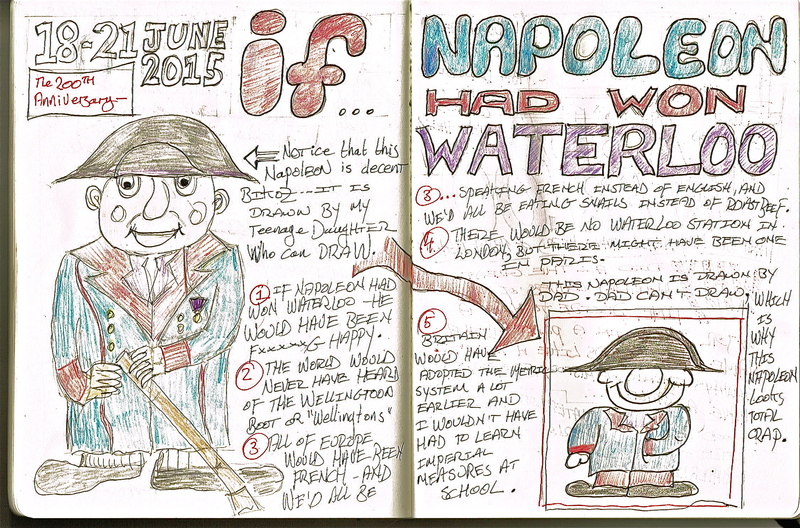 And finally – if Napoleon had won Waterloo, would what happened after, ever have happened? For the sake of some serious discussion – after 1815, the British more or less left Europe to its own devices and concentrated on « painting the map red ». Napoleon’s « nation of shopkeepers » built themselves the biggest trading empire the world had ever seen, whilst Europe … ? Well the French had about three more revolutions. The Belgians had their own revolution and became an independent nation. The Brits guaranteed Belgian neutrality under the 1830 Treaty of London, and in 1914, the Brits were back across the Channel defending the Belgians against the Germans. And the Germans – well they did unified and did a lot of muscle flexing and they went to war with the Danish in 1868 and then the French in 1870 and then in 1914 they just went to war with everybody. Would all this have happened IF …. On this 200th anniversary of the Battle of Waterloo, Britain is seemingly preparing it’s exit from the European Union (EU); fed up of politicians and bureaucrats at the EU HQ in Brussels, telling us all how to lead our lives. UK Prime Minister, David Cameron, has promised a national « IN/OUT » UK referendum on Europe in 2017. Vote YES to leave Europe and … well the UK (as it was then) left Europe to its own devices from 1815 to 1914, and look what happened. Ironically, Waterloo is only 20 kilometres (Sorry! 15 miles) from Brussels. So 200 years ago, the fate of Europe was being fought out at Waterloo, and now, the future of the European Union is under discussion in Brussels. France is of course an ally now. France recently rejoined NATO, and there are now strong military links that have been forged between France and the UK. Both counties are building a Joint Rapid Reaction Force (JRRF) and British soldiers regularly use French facilities for training. Certainly 200 years on, we are both getting on militarily. On the political front though? YES FOLKS. France is still the big BOGEY MAN. The French want Europe all their own way. If you believe some of the rubbish spouted by the British tabloids, you might think that Napoleon is alive and well in France and poised to cross the English Channel, (which the French call « La Manche), set up camp on Trafalgar Square, tear down Nelson’s Column and lock up the Queen in the Tower of London and throw away the key. Oh Dear! Greatest perpetrators of the anti French feeling are The Sun, The Daily Mail and the Daily Express. The Sun, well that’s still a kind of working class Tory paper, read by the kind of people who wouldn’t come to France anyway, unless it was a day in Calais to buy cheap booze and cigarettes. As for the latter newspapers, well, read the Mail and the Express. On the front page they might be sounding off against the French and come the travel pages, they’ll be telling you about «dream holidays in France. » Seems we like the country but not the people. The Brits drink the wine, eat the cheese, wear the perfume and buy the cars, but as for the French themselves, that is different. So, if Napoleon had won Waterloo? Well, I wouldn’t be writing this. And what if the French hadn’t won the 100 Years War? Posted in Culture, Education, Food, France, History, Holidays, language lessons, Military, politics, Tourism, Wine and tagged Belgium, Brussels, Europe, Napoleon, the European Union, Waterloo. Bookmark the permalink. Very good article! Although, already diminished by a severe stomach cancer at the time of Waterloo, Napoleon would anyway not have been able to rule Europe for long.